A treasure trove of ancient pieces of marble has been discovered hidden beneath a cellar floor in a destroyed 13th century building in Akko. A treasure trove of some 350 rare pieces of marble, hoarded beneath an ancient cellar floor, have been uncovered during an excavation conducted approximately 100 meters north of the Old City wall of the coastal city of Akko. According to Dr. Edna Stern, excavation director for the Israel Antiquities Authority, “The marble was concealed as one would bury a jar with gold coins. It seems that the owner was in fear of impending danger." The unique find, which dates 800 years back to the Crusader period (the thirteenth century CE), includes a collection of 350 marble items that were gathered from buildings that had been destroyed. The hoard was found during an archaeological excavation conducted by the Antiquities Authority prior to construction by the Akko municipality of a new building to house classrooms in the Hilmi Shafi Educational Campus. According to Stern, the find is exceedingly rare, "the likes of which have never been discovered in the Kingdom of Jerusalem (the capital of which was Akko) in the Crusader period," she said. "During the archaeological excavations we came upon a cellar that was sealed by collapse, comprised of building stones and charred beams. 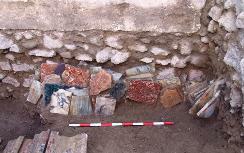 Beneath the cellar floor a hoard of approximately 350 marble items and colored stones was discovered, including two broken marble tombstones with Latin inscriptions (one belonging to a person by the name of Maratinus), flat marble slabs and marble tiles of various sizes and colors, etc. Some extraordinary items were also found, among them a large stone cross and a large fragment of porphyry (a rare precious purple stone, which has been the color of royalty from Roman times). The quality of the marble is excellent and it was undoubtedly imported from abroad." During the Crusader era, Akko was an important international trade center, she noted, adding the marble hoard reflects the magnificent buildings that existed in the area but had not survived, and the commerce and wealth of its residents. "Just as there is a trend today to incorporate wooden doors from India or roof tiles from old buildings in Italy in modern villas, at that time they used to integrate ancient architectural items from the Roman and Byzantine periods in their construction," Stern explained. "And just like today, people at that time also yearned for the classic and the exotic. We know from written sources that they bought and sold such stones, which were exceptionally valuable, to be reused in buildings. We can assume that the owner of the hoard, whether he was a merchant or he collected the stones for his own construction, was aware of impending danger and therefore buried the valuable stones until such time as the tension abated." However, the cache of stones was not sold in the end. According to Stern, “We can reasonably assume that the collapse that was found above the hoard is evidence of the building’s destruction in 1291 CE, when Crusader Akko was conquered by the Mamluks and was completely devastated”. The marble hoard was removed from the field and transferred to the Israel Antiquities Authority for further study.